This article is about the American actor. For the British motorcyclist, see Jimmie Simpson. James Raymond Simpson (born November 21, 1975) is an American actor. He is best known for his work on television, which includes It's Always Sunny in Philadelphia, The Late Show with David Letterman, Psych, Breakout Kings, House of Cards, Hap and Leonard, Westworld, Black Mirror, and Unsolved. His feature film credits include Loser (2000), Herbie: Fully Loaded (2005), Zodiac (2007), The Invention of Lying (2009), Date Night (2010), Abraham Lincoln: Vampire Hunter (2012), White House Down (2013), and Under the Silver Lake (2018). Simpson was born and raised in Hackettstown, New Jersey, the youngest of three brothers, and attended Hackettstown High School, where he took his first class in acting. After graduating from Bloomsburg University with a Bachelor of Arts in theater, he acted for four seasons at the Williamstown Theatre Festival in Massachusetts. In 2000, Simpson made his feature film debut in the teen comedy Loser, directed by Amy Heckerling. This was followed by various roles on television, including the Stephen King miniseries Rose Red, and appearances on 24, NYPD Blue, Cold Case, and Carnivàle. Subsequent film roles included Herbie: Fully Loaded, with Lindsay Lohan (2005); Seraphim Falls, with Liam Neeson (2006); and David Fincher's critically acclaimed Zodiac (2007). In 2008, Simpson starred in The Farnsworth Invention on Broadway, opposite Hank Azaria. His portrayal of Philo T. Farnsworth was described as "superb" by The Chicago Tribune, and earned him a Theatre World Award. From 2008–09, Simpson made several guest appearances as Lyle, a fictional intern, on The Late Show with David Letterman. During that time, he also appeared in episodes of CSI: Crime Scene Investigation, My Name is Earl, House, and Psych; and had supporting roles in the films The Invention of Lying, directed by Ricky Gervais (2009), and Date Night, with Steve Carell (2010). Other notable credits include the cult TV comedy series It's Always Sunny in Philadelphia, on which he appeared over several seasons as Liam McPoyle, and the A&E series Breakout Kings, where he starred as Lloyd Lowery. From 2012–14, Simpson appeared in the films Abraham Lincoln: Vampire Hunter, The Truth About Emanuel, and White House Down. He then appeared as Gavin Orsay, a recurring character, on the Netflix series House of Cards (2014–15). For this, Simpson — along with the rest of the main cast — was nominated on two occasions for the Screen Actors Guild Award for Outstanding Performance by an Ensemble in a Drama Series. In 2016, Simpson starred with James Purefoy on the first season of SundanceTV's Hap and Leonard. That same year, he appeared in a principal role on the first season of HBO's Westworld. His portrayal of William — a visitor to Westworld; a futuristic Wild West-themed amusement park populated by androids — was described as "spellbinding" by Variety. For his work on Westworld, Simpson was once again nominated for the Screen Actors Guild Award for Outstanding Performance by an Ensemble in a Drama Series. The following year, it was announced that Simpson would return for the show's second season. For his performance in the second season, he received a nomination at the 70th Primetime Emmy Awards for Outstanding Guest Actor in a Drama Series. In 2017, Simpson starred in "USS Callister", the first episode of the fourth season of Charlie Brooker's critically acclaimed anthology series, Black Mirror. For his performance, he received a nomination for the British Academy Television Award for Best Supporting Actor. Simpson met actress Melanie Lynskey in 2001, when they both appeared in Rose Red. The pair became engaged in 2005 and married on April 14, 2007, in a chapel near Queenstown, New Zealand. Lynskey filed for divorce from Simpson on September 25, 2012, citing irreconcilable differences. The divorce was finalized in May 2014. He married actress Sophia Del Pizzo in April 2019. 2002 The Division Sean Townsend Episode: "Forgive Me, Father"
2003 NYPD Blue Mike Episode: "Bottoms Up"
2003 Cold Case Ryan Bayes Episode: "Churchgoing People"
2008 Eleventh Hour Will Sanders Episode: "Resurrection"
2009 House Father Daniel Bresson Episode: "Unfaithful"
2010 Party Down Jackal Onassis / Dennis Episode: "Jackal Onassis Backstage Party"
2011 How I Met Your Mother Pete Durkenson Episode: "The Naked Truth"
2013 Unsupervised Matthew / Dean Jacobs (voice) Episode: "The Great Traveler's Road"
2016 This Is Us Andy Fanning Episode: "Last Christmas"
2017 Black Mirror James Walton Episode: "USS Callister"
2018 Dream Corp LLC Patient 21 Episode: "Deep Impact"
^ Herzog, Kenny (November 23, 2016). "Westworld's Jimmi Simpson Is Having a Hell of a Year". Paste. Retrieved July 14, 2018. ^ Newman, Melinda. "Jimmi Simpson, Hollywood’s Favorite Creep; Jimmi Simpson, star of SundanceTV's upcoming Hap and Leonard, recalls his 'really great' Hackettstown upbringing and "Jersey Style" barbecues. ", New Jersey Monthly, March 1, 2016. Accessed July 25, 2018. "At Hackettstown High, he took one drama class 'and it didn’t quite make sense to me,' Simpson says." ^ Gelt, Jessica (April 22, 2015). "Jimmi Simpson goes ape for his 'Trevor' theater role". Los Angeles Times. Retrieved July 14, 2018. ^ Jones, Chris (December 6, 2007). "Broadway's 'The Farnsworth Invention' is pure Sorkin". Chicago Tribune. Retrieved July 14, 2018. ^ a b "Theatre World Award Recipients". Theatre World Awards. Retrieved July 14, 2018. ^ Leopold, Todd; Hanks, Henry (May 15, 2015). "David Letterman's cast of characters". CNN.com. Retrieved July 14, 2018. ^ Nededog, Jethro; Sneider, Jeff (June 10, 2013). "'Breakout Kings' Alum Jimmi Simpson Joins 'House of Cards' (Exclusive)". Retrieved July 14, 2018. ^ a b "Nominations Announced for the 21st Annual Screen Actors Guild Awards". SAG-AFTRA. December 10, 2014. Retrieved July 14, 2018. ^ a b "Nominations Announced for the 22nd Annual Screen Actors Guild Awards". Screen Actors Guild Awards. December 9, 2015. Retrieved July 14, 2018. ^ Ryan, Maureen (April 13, 2018). "TV Review: 'Westworld' Season 2 on HBO". Variety. Retrieved July 14, 2018. ^ a b "Nominations Announced for the 23rd Annual Screen Actors Guild Awards". Screen Actors Guild. December 14, 2016. Retrieved July 14, 2018. ^ Houghton, Rianne (July 24, 2017). "Westworld season 2 brings back Jimmi Simpson aka Young William, but why?". Digital Spy. Retrieved July 14, 2018. 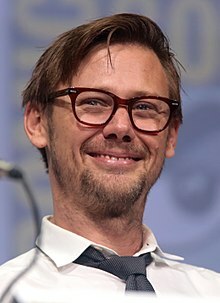 ^ a b "Jimmi Simpson". Television Academy. Retrieved July 14, 2018. ^ a b Bakare, Lanre (April 4, 2018). "Bafta TV awards 2018: full list of nominations". The Guardian. Retrieved July 14, 2018. ^ "Celebrity Wedding: Melanie Lynskey and Jimmi Simpson". InStyle. Archived from the original on 10 June 2009. Retrieved July 14, 2018. ^ Johnson, James (October 7, 2012). "Melanie Lynskey Files For Divorce From Jimmi Simpson". Retrieved October 7, 2012. ^ "'Two & A Half Men' & 'Always Sunny' Stars – Nicest Divorce Ever". TMZ. May 23, 2014. Retrieved June 24, 2014. ^ "Celebrity Weddings 2019: Jimmi Simpson and Sophia Del Pizzo". Us Weekly. April 15, 2019. Retrieved April 19, 2019. ^ Martinez, Vanessa (April 9, 2013). "'The Retrieval', 'God Loves Uganda' Win "Best" Jury Awards at Ashland Indie Film Festival". IndieWire. Retrieved July 14, 2018.